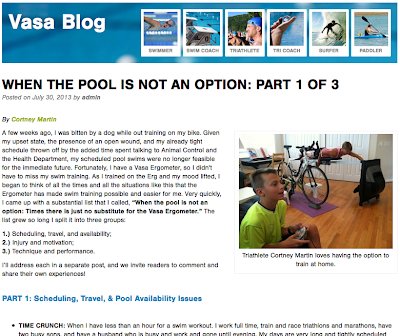 Vasa recently published the first of a series of blog posts I put together about the unique benefits of their Swim Ergometer. If you are not familiar with this piece of equipment, it can be described as a swim version of a rowing machine. It's built around a smooth, quiet flywheel and uses paddles and a padded platform on a monorail to provide a swim simulator that is, for many purposes, better than a pool. 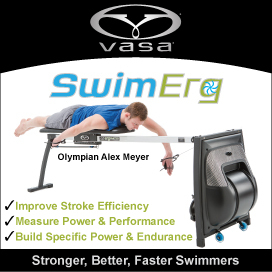 Just as a bike trainer is a valuable complement to cycling, so is the Ergometer to swimming. One day I just started thinking about all the unique things about it, all the times it's really come in handy (especially as a busy working parent), and I sat down and cranked out a long list that I sent to Vasa. They liked it, but it was so long, that they suggested splitting it into three posts. So rather than rehash it all here, and go on and on...here's a link to the first. And YES I am still using the Ergometer faithfully, with twice-a-week workouts from Coach Eric Neilsen who has worked with the Vasa Trainer and Ergometer for many years.